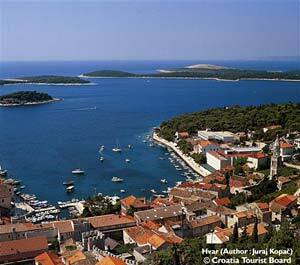 Most people who travel to Korcula also visit Hvar Island as this is Korcula neighbouring Island and as good neighbours, I would like to add to this site some info about the island including how to reach it from Korcula, Mljet, Dubrovnik, Split and Vis. These are all frequently asked questions on our travel forum as well as in emails I receive daily. Update: check an excellent new site about ferries in Croatia where you can find all ferry schedules of Croatian ferries, including an exhaustive list of Ferries to Hvar Island with all latest schedules/timetables and prices + also see timetable for Ancona, Italy to Hvar (Stari grad) Ferries if you are visiting via Italy. Accommodation on the island could be difficult to find in the summer months so I would recommend doing your accommodation booking in advance unless you plan to visit the island out of season. Although most visitors to the Island stay in Hvar Town, there is also a lot of accommodation available in neighbouring places – Vrboska, Jelsa, Stari grad…in these places accommodation is much cheaper than in the Town itself.